With the technology that’s available today, travelling within Australia has been made much easier, especially when it comes to 12v electrics. These days, we have the ability to recharge all sorts of portable devices; from phones to cameras, to portable and fixed fridges for keeping our food and drinks cold. Then by adding an inverter that allows us to run 240v products from 12v batteries, the humble camping road trip can be so much more! The one big change we’ve made has been the introduction of solar to our setups. This means we can camp and have the energy from the sun recharge our batteries so we can do it all again tomorrow and the day after that…and with the right set up, we can just keep going on and on. We are really strong advocates of solar, and have been using it now for quite some time. It has allowed us to stay really remote for long periods of time, yet we still have access to refrigerated food and drinks. In fact, these days we travel with freezers so we can travel with an array of food options. When looking back, our first solar panel set up was very basic! It comprised of a fixed style panel that had hinges added to join the panels together, and leads that plugged into a black box regulator with a couple of alligator clips that hooked around the battery terminals. Like everything in life, when it comes to technology, the race to constantly keep on improving and introducing new exciting products in the recreational lifestyle industry means today we can choose from many different types of solar related products and set ups. So today we use a mixture of solar panels and devices to control our power requirements. This type is great as they are a “set and forget” option, other than keeping them clean to maximise their capacity. When we travel, our aim is to arrive at the end of the day at our destination with all of our batteries at 100% capacity. By having fixed panels in place means that even if we stop for a couple of hours to go exploring, we can still recharge our batteries, provided we leave our fixed panels in the sun. We also have used this type as their distinct advantage allows you to place them in positions throughout the day where they collect the maximum sunlight hours possible. However, they are bulky to store, and their size can make them heavy. So it really comes down to a trade-off – size vs capacity. 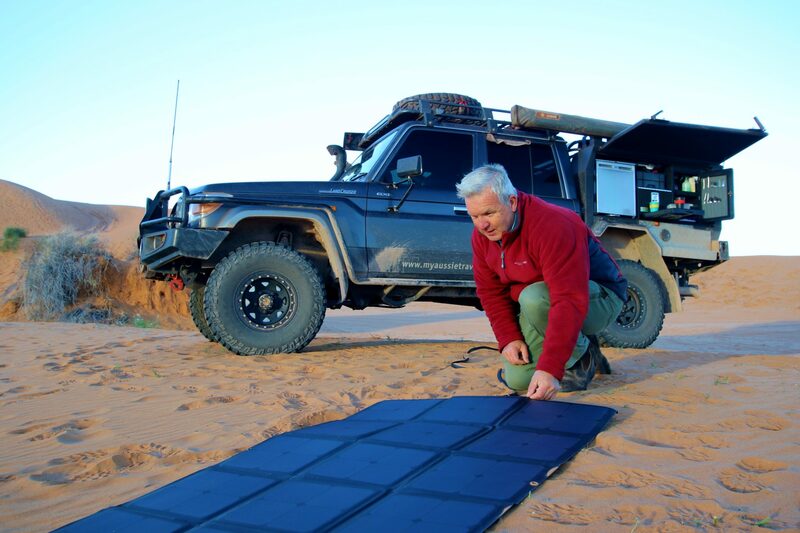 This option means we travel with the solar panel in a fixed position, but once set up at camp, we can turn that fixed panel into a portable style. This allows us to position it to track the sunlight hours. The key here is having a quick release, user friendly solution that turns that fixed panel into something portable. 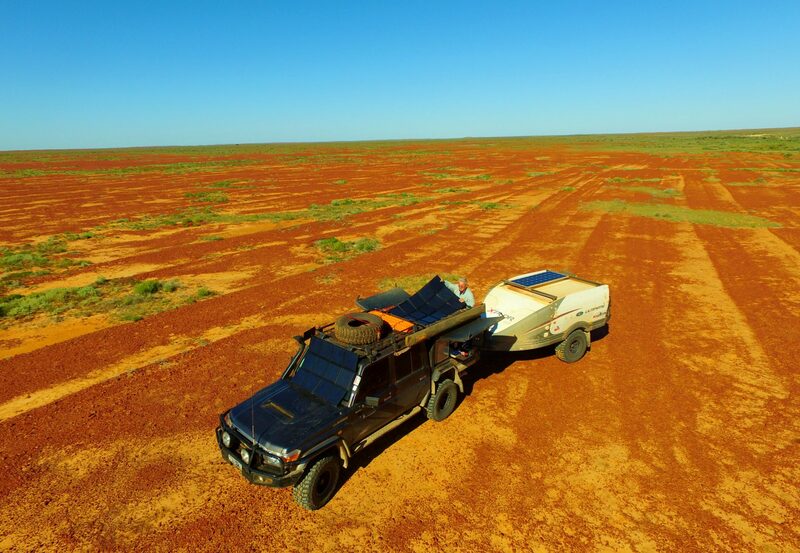 We are trialling this idea with our REDARC monocrystalline panel on our camper trailer. Now these little beauties solve so many of the weight and bulk issues. Folded up, they are about the size of a briefcase which makes storing them so easy. Being light and quick to fold out, you can simply place them flat on the ground. As the panels have eyelets, this allows an array of possible locations they can be affixed to. In our case, the windscreen is a perfect spot, but the wall of our camper or on top of our vehicle’s roof rack are also good solutions. When you’re travelling, environmental conditions can change. So having flexible arrangements when solar recharging means you can have a solution ready to put in place regardless of the elements or the positioning of your set up. 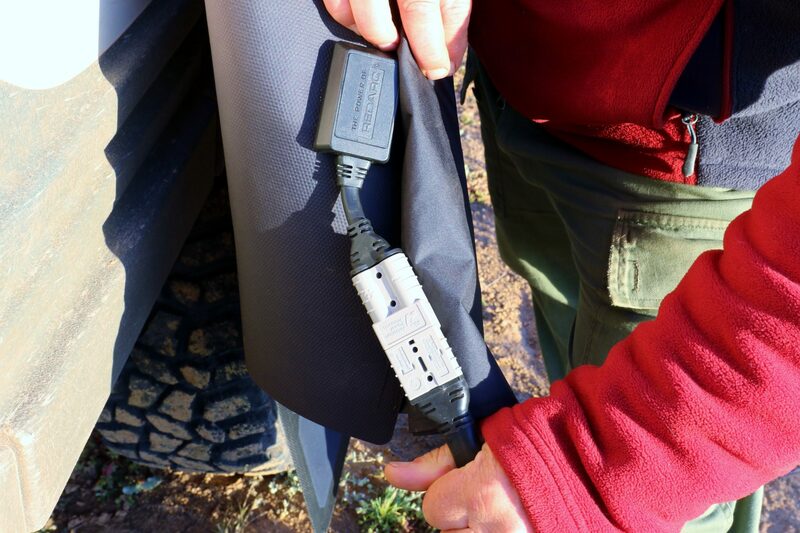 Mixing your panels with quick release connectors like Anderson plugs and using good quality heavy duty cabling means locating panels around your camp is not only easy, but also quick. Anyone can do it, and you really can’t go wrong, as they only connect one way. One big advancement that takes your solar to the next level is the method you use to connect it through to the batteries. Using equipment such as BCDC and BMS devices ensures you will get the maximum volts and amps transferred into your batteries with the minimum of fuss. REDARC BMS systems go one step further by recording the information of how many watt hours have actually been collected during the day, as well as displaying the State of Charge (SOC) by flicking through the multiple information screens available. This helps determine when might be the best time to be recharging your portable devices to take advantage of the maximum solar hours available. At the same time, keeping things flexible with portable regulators allows you to take your portable panels to charge other batteries that might not have standalone devices attached to them. 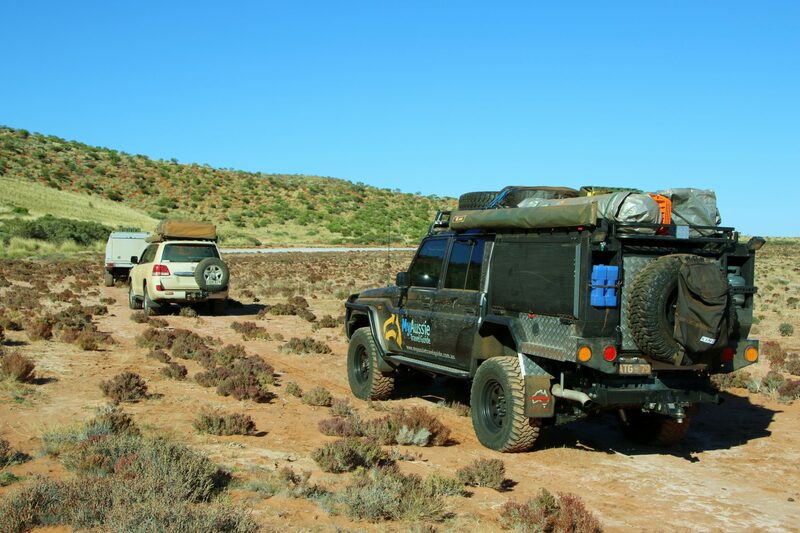 There is something special about being remote and off the grid, yet we can still travel with some creature comforts, thanks to our 12v battery and solar solutions. So regardless of your type of travel or the set up you have, there is a solar solution to make your travelling a whole lot more enjoyable just waiting for you!